This topic has 2 voices, contains 6 replies, and was last updated by dario 35 days ago. How to install Stories(Blog) extension? ThemeBurn Support › Forums › OpenCart Themes › Pavilion OpenCart Theme › How to install Stories(Blog) extension? I’m trying to install Stories(Blog) extension. How to do that? I have a clean installation of BurnEngine 1.3.2 on Opencart 3.0.3.1, Pavilion MInimal theme. If I click Blog on the main menu I can see “Fatal error: ‘Cannot find stories settings. Most probably the stories extension has not been installed from the admin panel’ ” (image 1). 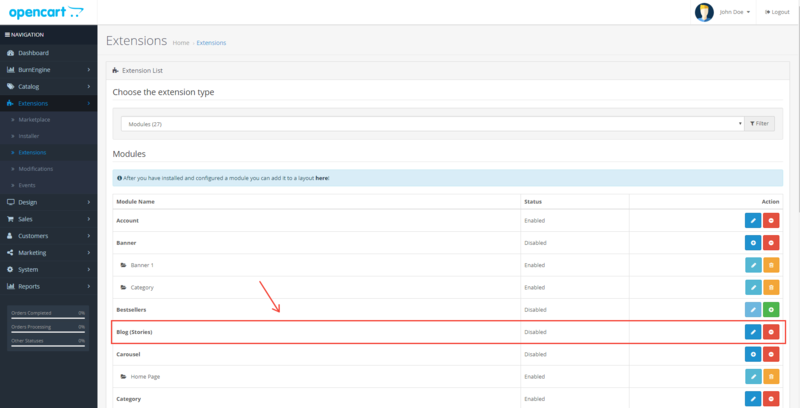 Also there are no Blog link in the admin panel (image 2). In this case, we will need website url, admin and ftp access. Any updates about the problem? Accidentally I found the solution so you can mark this thread as resolved.